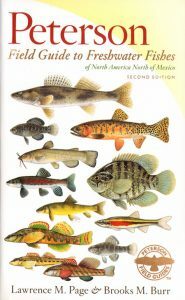 Peterson field guide to freshwater fishes of North America, north of Mexico. Artist/Author: Page, Lawrence M. et al. Fully revised and updated the second edition of this field guide includes over 100 new species including 19 marine invaders and 16 newly established non-native species. This second edition includes all-new maps and a collection of new and revised plates. Some of the species found in this area can only be told apart by minute differences in coloration or shape, these beautifully illustrated plates reveal key identification features for each species. The guide includes detailed maps and information showing where to locate each species of fish, whether that species can be found in miles-long stretches of river or small pools that cover only dozens of square feet.